Is This Man Too Crazy to Be Executed? It’s March 7, 2004, Andre Thomas breaks down the door of the Sherman, TX apartment of his wife, Laura Boren. He begins fatally stabbing his 20 year old wife, her infant daughter, Leyha Hughes, and his four year old son, Andre, Jr. He then uses his knife to carve out the hearts, and other organs, of his victims. He places their hearts in plastic bags and puts them in his pockets. He stabs himself several times and returns home to talk to family and friends about what he has done. His victims’ organs are still in his pockets. Thomas then walks into the Sherman Police Department. He tells the police dispatcher that he has murdered the three. He says God told him to kill the victims. The Grayson County, TX, District Attorney’s Office charges him with capital murder for the three deaths. Five days later, while sitting in jail reading the Bible, he reads Matthew 5:29. “If your right eye causes you to stumble, gouge it out and throw it away.” So, he gouges out his right eye and throws it away. While waiting for trial, three specialists examine him. They conclude he is suffering from schizophrenia. After 45 days in a secured mental health facility, his illness was ruled mostly substance-induced and that he was fit to stand trial. On November 3, 2005, Thomas is convicted of the three murders and sentenced to death. After being convicted, Mr. Thomas attempts suicide by trying to cut his throat. Fast forward to December 8, 2008. Andre Thomas pulls out his remaining left eye and eats it. Yes, you read that right: he ate his remaining eye! He claimed that eating his eye was necessary to prevent the government from reading his thoughts. Since that time, Mr. Thomas – totally blind- has been in a prison psychiatric unit on Texas’ death row awaiting execution. How Crazy Do You Have to Be to Be Too Crazy? Typically, a McKinney Criminal Attorney, will explain that there are two issues related to mental illness and the criminal justice system. The first issue a Criminal Defense Lawyer will review is: Is the defendant competent to stand trial or enter a guilty plea? The second issue is: Was the defendant criminally insane at the time the crime was committed? Was Andre Thomas Competent to Stand Trial? Courts require a defendant to be competent before standing trial or entering a guilty plea in order to make sure court proceedings are fair and to ensure the defendant receives due process. understand the elements of the charges, the gravity of the charges, and the potential penalties. Uninteligence, education level, language difficulties, and challenges communicating are usually insufficient to support a finding that a defendant is incompetent. If the court determines the defendant is able to understand the surroundings, receive and interpret information, and make decisions based on that information, it will likely find the defendant competent. Ultimately, competency is a very low threshold-a defendant need not have a sophisticated understanding of the case in order to be fit for trial. In Mr. Thomas’ case, it was argued that he was not competent to stand trial. But, Thomas was sent to a mental hospital. After six weeks of treatment with medication and therapy, he improved. One psychologist, who thought Thomas was exaggerating his symptoms, altered his diagnosis to “substance-induced psychosis.” Andre Thomas was judged by the Court competent to stand trial. He was convicted and sentenced to death. In Texas, a person is legally insane if criminal conduct was a result of severe mental disease or defect, so that the person did not know that his conduct was wrong. The term “mental disease or defect” does not include an abnormality manifested only by repeated criminal or otherwise antisocial conduct. In Mr. Thomas’ case, his lawyers never denied that he committed the murders. Instead, they argued he should be found not guilty because his mental illness prevented him from knowing right from wrong. The prosecution said he wasn’t crazy, he was high-and that his psychosis was either caused by his drug and alcohol abuse or made worse by it. Ultimately, they said, Thomas knew right from wrong. The jury agreed, finding Thomas guilty and sentencing him to death. So, if you knew the difference between right and wrong at the time you murdered someone and understand what’s happening in your case, you can be held able to stand trial and found guilty- even if you are Andre Thomas. 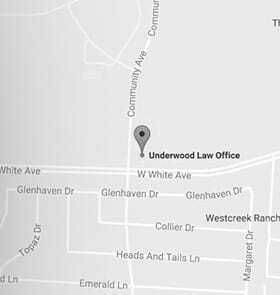 Let a McKinney Criminal Defense Lawyer at Underwood Law Office help when you have been arrested. We have handled decades of criminal cases. A McKinney Criminal Attorney can help you achieve results that you need in your criminal law case. For both offices, call our toll-free number 844.UNDERWOOD (844.863.3796) for a free consultation with a McKinney Criminal Attorney.